Nick Eng comes out of nowhere –Reno, Nevada, actually – to give us a seriously good debut album appropriately titled Nick Eng. The cover photo may have consciously attempted to channel the early John Lennon look – also appropriate. The songs contained within have a distinctively 60’s vibe to them. Most importantly, the requisite pop hooks are present and accounted for. “Reminiscing” is an instantly catchy song and a great lead off track. The first few notes are reminiscent (sorry, couldn’t help it) of a track from Any Trouble’s first LP, so I was immediately at home. The melody takes you on a great ride and the chorus is the payoff. “On Cloud 9” is a start to finish hook and very possibly one of my favorite tracks on the record. Some years back there was a bootleg tape floating around with Harry Nilsson and Micky Dolenz goofing around in a studio. “Someday, Someone” kind of reminds me of that recording. And, there’s plenty more to like on Nick Eng’s introductory offering. 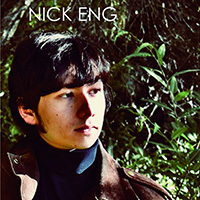 Although its early, Nick Eng’s debut album has to be considered as one of the best power pop albums of the year so far. You can get Nick Eng – Nick Eng at his bandcamp page in digital or compact disk by visiting HERE.